MTV's Musical March Madness tournament is off and running, with 64 bands bringing the full-court press in the hopes of ending Tokio Hotel's reign as champions. And, if history is any indication, this year's strongest challenger may come from the West Region. 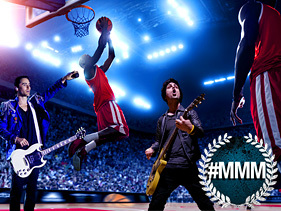 Yes, in the four-year history of MMM, no region has produced as many tournament-tough bands as the wild, wild West, with the likes of My Chemical Romance, 30 Seconds To Mars, Blink-182 and 2011 champions Green Day battling their way through the bracket. And this year, that trend continues, as the West is loaded with bands primed and ready to make a run at the crown. And with first-round voting underway in all Musical March Madness matchups — polls close on Monday, March 25 at noon ET — we here at tournament HQ are breaking down the full field of bands competing for the title. Yesterday, we took a look at the action in the Midwest, and today, we're turning our attention to the West, where the sun may set, but a champion may also arise. an armload of Grammys, all without ever wearing a pair of socks — and enter this year's tournament with the swagger of a champion. Of course, they felt pretty confident last year, too ... only to lose in the opening round to Semi Precious Weapons. Things look better for them this year, as they're staked to a pretty sizeable lead over #16 Silversun Pickups, and, if they can hold on, they might not be challenged again until they run into Green Day in the Sweet 16. But first things first; the name of the game when it comes to the tournament is survive and advance, after all. Maroon 5 grabbed the second-seed in the region, which was a shock to many, though the selection committee was quick to point out their tremendous RPI (and Adam Levine's abs) ... and so far, they're living up the hype, holding a double-digit lead over #15 the Shins. Levine & Co. have a tough second-round opponent looming in Thirty Seconds To Mars, but if they manage to power their way past Leto's squad, well, they're set up for an easy run to the Elite 8, especially given the struggles of #3 Bruno Mars, currently locked in a tight battle with #14 Queens of the Stone Age. Of course, we can't overlook #4 Green Day, who look to put the distractions of the previous year behind them and make it back to the title game. It would be their third championship appearance in four years, and as they've proven time and time again, no one is a tougher tourney out than Billie Joe and the boys. Just ask their first-round opponent, the overmatched Deftones, if you don't believe us. Other early-round action sees #5 the Postal Service tangle with #12 Tegan and Sara, and right now, it's the Quin sisters who hold a commanding lead. Things are tough in the matchup between #8 No Doubt and #9 Red Hot Chili Peppers, with RHCP holding a slight lead withplenty of time left. And, the battle between tournament vets #6 Blink-182 and #11 Pearl Jam also seems destined to go right down to the wire, as its Blink by a nose after two days of voting. Can any of these bands shock the world and knock off the West's heavyweights? Well, that'll be up to you to decide ... but whomever wins the West may very well be the band that hoists the MMM trophy next month.